Here you’ll find several different types of videos. 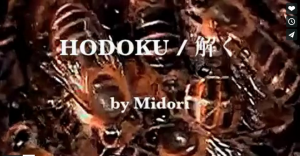 Some, such as for “Hodoku”, are video components of a larger body of work. Others are documentations of performances, process of creation, or discussion of the work. An interactive performance unraveling an ancient human silence from our frenetic modern existence. A multi-sensory experience involving motion, tactile experience, scent, participation and video. Yamamba ( 山姥 ) lives in the dusky edge of the primordial, on the fringe of civilization’s subconscious. The Yamamba, or the mountain hag, is a character that’s been with Midori since 1998. She appears in many of Midori’s performances, often in site-specific pieces. Blow-up dolls: Midori’s art gives exhibition goers the chance to be up close and personal with these objects of derision. Her art is approachable and interactive; people are encouraged to play with it and in doing so find the humor and pathos of a plastic woman. Commissioned by the Asian Art Museum of San Francisco to create an interactive party-as-performance-art as the opening night gala for the Floating World exhibition. The party, titled “Seduction” brought the attendees into the spirit of revelry and the reinterpretation of the pleasure quarters depicted in the 17th century scroll. A 9′ tall sculpture of Anubis, the Egyptian God of the Dead, made of fresh cut flowers densely arranged onto a steel skeleton, stands on a stage of loam, dirt and leaves. The flowers, initially fresh, decay and dessicate over the duration of the six week long exhibition.